After looking last episode at the US Federal Government's Reform Plan and its changes to digital Government to Business service delivery, this week Gavin looks at the broader digital capability improvements proposed. From a research institute sounding like its sprung out of a super hero comic, to the gritty facts of evidence based decision making and customer-centric digital front doors, the online channel has so much to gain and capitalize on in this reform plan. And that can only benefit Government to Business services in the United States. But like last week, its not just US Federal government agencies that get something out of this reform plan. American states, municipalities and governments outside the US can all benefit from the strategic leadership and direction being set that you can learn and benefit from. What game changing digital capabilities are proposed in America's federal reforms? 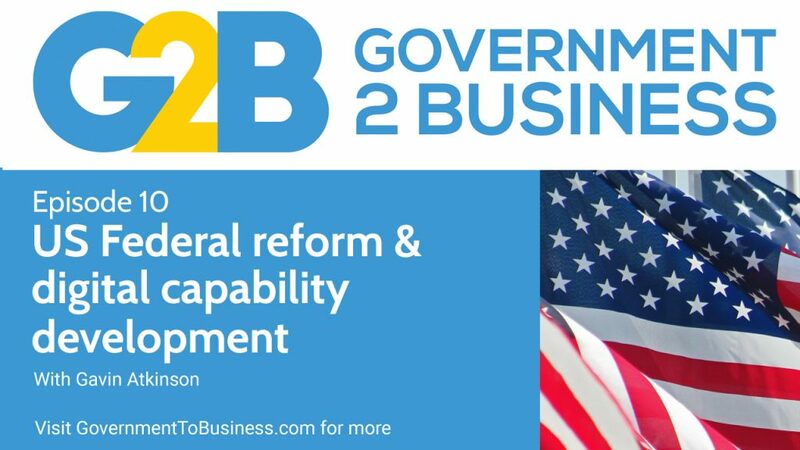 Gavin: G'day folks and welcome to part two of the Government to Business podcast review of the US Federal government's reform plan specifically relating of course to Government to Business digital service delivery. My name's Gavin Atkinson and last week we talked about the three new program areas that were proposed by the White House to improve the way that the US Federal government was dealing with service delivery to business. And that was about creating a Bureau of Economic Growth, consolidating and streamlining financial literacy efforts and streamlining the small business programs that were being delivered. And that was all around about bringing together and consolidating, really across all the federal government - access to grants, technical assistance, financial literacy for business owners, contracting and purchasing and of course access to capital. So they were very specific from a program point of view obviously to what governments delivered to business. As I mentioned to you last week this information is obviously top of mind if you're within the US Federal government, but it's equally applicable if you're within the US state government system or maybe municipal or local government in the US or even tribal governments. Because a lot of the proposals that we've discussed in this particular podcast series relate not just to the US Federal government but they actually flow through very much to the thinking and way things are being done at a more local level within the United States. And on top of that if you happen to be outside the United States a lot of the information that's being provided and particularly this episode, I think we will find will be highly relevant to your local jurisdiction. So last week as I discussed the reform areas were specific to business customers to government. The next three that I'm going to be talking about today are all about the capability development across the whole of the US Federal government. So they relate just as much to citizen related digital service delivery, but obviously have a really strong focus as far as the Government to Business service delivery is concerned as well. The first one I want to talk about is a proposal called the GEAR Center. Now, obviously government we love acronyms, so in the US, that's no different. So GEAR stands for the Government Effectiveness Advanced Research Center. It sounds a bit like the way Marvel Comics or someone would come up with an acronym first and then build the words around it, but on them, maybe I'm just being a bit too cynical there. Anyway, the GEAR Center is essentially a public-private partnership to help government better respond to innovative technologies, business practices and research findings. So the big question here is what's the goal? What's it trying to achieve? And what it does it basically presents opportunities for government to improve its use of public resources, improve the way its delivering its mission and its services to citizens. Wait a sec, wait a sec. Did you hear that right? Citizens? What about business? Now this is either a dramatically missed opportunity or one of those unfortunately all too common occurrences that government tends to fly on default thinking that citizens, well, you know that kind of includes businesses as well, because you know, business owners are citizens too aren't they? But I think by specifically mentioning citizens and not mentioning businesses this particular proposal misses some of the nuances around how business customer journeys are different, how the legal structures and the business process challenges that as a result being presented to business owners are different, and the message that basically only referring to citizens sends to executive decision makers who control budget resources and of course strategic direction. So I do think that's a bit of an issue. I do hope it's an oversight rather than something that's actually being just delivered specifically for citizens themselves. Because I think government is missing out on a great opportunity there if the actual business customer audience isn't included as part of the scope of work for the proposal for the GEAR Center. So anyway, let's progress anyway but let's assume that the GEAR Center includes business customers and services in its remit. The GEAR Center aims to engage researchers, academics, nonprofits and the private sector, covering a whole range of different areas. And to be honest a lot of the big three that they talked about I think are really the perfect amalgam of where we need to be going across government digital service delivery at the moment, particularly for business. And that's all around about behavioral economics, computer science and design thinking. So it's all around creating, I suppose, a creative data-driven and Interdisciplinary approach to reimagine and realize new possibilities and how citizens and government interact. Urgghhh. There's that word again: citizens. Sorry. I'm reading that little bit from the actual the document. I just find it's so jarring. Ahhh, anyway. Let's just keep progressing, my apologies for that. I promise I won't do it again. But I do find it exasperating and I'm sure you have this all the time when you find that your particular jurisdiction if they happen to put out an actual government direction or strategy that just throws around the citizen word. Thinking that that's going to catch everybody. Look, use customer, use client, use whatever you need that's going to include citizen and business, But don't just put the word citizen out there. Anyway, moving on. The proposal addresses some big-picture issues as well such as assessing the longer-term strategic needs of government and adopting that test and learn approach to innovation and it talks about testing hypothesis, rapidly developing prototypes and services and models and but better yet it's not just about government getting up to the same level of innovation as I suppose the more innovative parts of the private sector. It's actually around building on that and in creating the foundations for where government services and operations need to be in five years, ten years, it even talks about twenty years time, which probably I think is a bit too far over the horizon. But you never know your luck in a big city. So, let's be honest, government does find it hard to focus on the bigger picture time frames when often the next election cycle usually hijacks product development and delivery. The detail on facilitating all this is wrapped up in issuing challenges under the America COMPETES Act in tandem with an open request for information process. So this is the way that the US Federal government is approaching it. Basically it's a way of supporting an open transparent approach to call on interested parties to put forward their ideas on addressing challenges with prizes that may or may not be monetary in nature. Another interesting side note in the plan, is this particular proposal channeling the whole nature of bipartisaness. Talking about the prior approvals given to the America COMPETES Act by both Presidents George W Bush and also President Obama. So a long story short, the proposal could deliver some pretty amazing benefits the way that government addresses the problems of business and how to better deliver to them. Assuming a business is a citizen of course, it's one of those concepts where I expect a significant variation will occur, so there'll be certain degrees of success. That said it's a far better approach then just a simple "steady as she goes" type of philosophy when it comes to digital service delivery to business. Strengthening federal evaluation: love it! The second area that I'd like to talk about is the proposal about strengthening federal evaluation and I really, really love this one. Strengthening federal evaluation has its link linchpin something dear to my heart. And that's about bringing evidence to bear in decision making. This proposal actually pushes agencies to adopt stronger practices, to create more evidence about what works and what needs improvement to inform mission-critical decisions and policies. Now while I'm sure we all sign up to this concept in the digital space, particularly the Government to Business digital space, it's absolutely critical. All of us have at our hands the ability to make a massive impact. The nature of the digital channel, and when executed well it's propensity to achieve channel migration with massive time and money savings to both business and government cannot be understated. Having a clear focus on evidence and evaluation can only strengthen that channel, driving resources from poorly used and configured channels - read offline channels - to your channel, where you can make it much bigger impact. Now up front this particular proposal identifies presently a lack of consistency in support to agencies in evaluating programs and activities. And again an olive branch is embraced in the narrative, putting out and referencing the Bipartisan Commission on Evidence-Based Policy Making's recommendations and draft legislation. It calls on agencies to start looking at testing innovative strategies and programs but having the necessary tools to then effectively evaluate them. There's a clear emphasis on having an accountable senior official responsible for the agency's evaluation activities and information and evidence that's reported back to the Office of Management and Budget. Now, this is great. It's absolutely spot-on. But what it needs to be is a very senior official so it's taken both seriously but given the necessary resources and the support internally to deliver against. And tied into this requirement is the need to document the resources that are dedicated to program evaluation. As without this it's basically practically impossible to assess where evaluation investments are adequate or under invested or over invested. I just love this. I just love it, love it. If I can digress, although it's still 100% relevant the fact is the Office of Management and Budget is responsible for delivering this. Now, why should that matter? Well for starters they put out the plan and as they're actually embedded inside the White House, you can bet your bottom dollar that they're basically, whatever they ask will be acted upon. Which is absolutely great. Putting your personal politics aside it's hard to argue against a focus on evidence and investment in programs that actually work and deliver benefits. And I think the reform plan's constant channeling of president's past, both Democrat and Republican, shows this. And it should be a focus that truly transcends politics regardless of your own personal political persuasions. The last thing I'd like to give a hat tip to in this particular proposal is a recognition of getting the balance right. Acknowledging the risk of establishing a more formal structure for federal evaluation and its potential impact on administrative rigidity and the complexity that could basically detract from innovation in the small number of agencies who are excelling in this area. Because you know, without this particular flexibility there's a real risk that those innovative agencies will be drawn back to a lowest common denominator, which is just counter-intuitive. The proposal does flag, however, that by mitigating that risk there needs to be some type of you know, green-lighting flexibility approach to recognizing the unique circumstances and the capacities of agencies and taking onboard the input from stakeholders. So that area is a little bit vague, but I'm pretty sure that what they're proposing is more like you'd have a general baseline of measures that would be consistent across all of government and then anything over and above that is just, you know, cream on the cake so to speak. So if they get the balance right, this could be a highly effective improvement that really does make a positive impact on Government to Business digital service delivery by having the evaluation processes and means to show where it works. Where it works well and the processes and the ways of delivering it from the customer journey that actually enhanced the experience and deliver that value to customers, particularly in the digital environment over the more costly offline environments and then to obviously be in a position to refocus investment into those areas, actually deliver those benefits. The third and the final area I wanted to talk on today is around customer improvement capability. So if you thought everything I've talked about before up to this point of time has great potential, you have not seen anything yet. A keystone digital element is the proposal for a Customer Experience Improvement Capability. As I said before and it sets a scene of transforming government to be far more modern, streamlined and customer centric. And unlike the GEAR Center it makes it 100 percent clear that this is all about transforming the customer experience for citizen and importantly business alike. Another aspect I think which is a great approach is how the proposal sets the Office of Management and Budget with a leadership and capability component to partner with federal agencies. This is being done with the US Digital Service in the General Service Administration's Technology Transformation Service to identify key customer groups. So a bit of a customer-centric view of the world there. Mapping their customer journeys in an end-to-end process across agencies, across programs, which is just perfect as far as things that concern when it comes to creating a seamless government experience. And then improving that experience across the delivery channels and organizational silos. Now I've kind of restrained myself from making too many quotes in today's episode but I'm going to let myself off the leash here. "While many agencies are taking action to improve their services, customer experience can lag when customer needs and journeys cross organizational silos. Where as government agencies execute their missions based on their specific authorities and responsibilities, customers tend to experience government across stovepipes,"
"For example, while the Federal government strives to support small business growth and competitiveness, duplicative and inconsistent programs spread across five different federal agencies have sometimes created confusion and extra work for the small businesses they mean to serve." Now incidentally this example seems a little bit in-congruent in my perspective, as it's not effectively dealt with in the reform paper aside from the three examples I mentioned last week about grants and capital and procurement. But a tandem approach of essentially creating a center of excellence to help support agencies creating incentives for a more holistic customer experience that truly does cut across agencies and programs, while building up agency capability and leveraging the subject matter expertise and back-end systems is just spot-on. The alternatives which is the centralized approach tends to create a "holier than thou" type of approach where basically agencies merely pay lip service to the vision of the central agency but try to do everything they can to do what they'd like to do themselves and this can be, you know, a pretty ineffectual approach if you're a small agency and you don't have the resources to do what you really want to do but big well-funded and resource agencies can ignore central activities at will. So there needs to be a natural incentive for them to embrace and actively participate in the experience to make sure that overall, it succeeds. And fostering a customer-centric culture is just not enough. Nor the flip side of a top-down set of commands either. Of course many governments take the easy approach of setting strategy and vision and just letting agencies implement against this but likewise this rarely works as even bigger agencies ignore it at will and smaller agencies are financially and resource constrained, and find it difficult to meet those requirements. And fundamentally it basically reinforces those agency silos those stovepipes that were mentioned within the actual plan. So that services aren't effectively joined up. The center of excellence approach, provided it actually is about genuine engagement, building true collaborative relationships is by far the best way to go. If you're able to throw in some funding for agencies, evaluated of course based on impact, you're on the path to a screaming success. This particular proposal aims to build on the existing work done in the private sector and also the US Digital Service to evaluate how services are delivered, identify priorities and focusing efforts on customer centricity and greater efficiencies. Now as I mentioned before I don't like reading straight from documents but the following section of the Customer Experience proposal speaks volumes about the US Government's digital plan and it really should resonate equally with federal agencies,state and municipal governments in America looking for national leadership and equally and most importantly if your government is outside the United States. Because of America's sheer size, presence and impact globally whatever it does flows through to all countries when it provides leadership. And that equally applies to digital government as it does to anything else. "This proposal envisions building on these individual efforts by adding the capability to tackle customer experience challenges throughout the government. To get started this capability and relevant agencies will conduct a research to identify the most significant opportunities for customer centric change, develop customer journey maps which cross organizational silos and then develop action plans to execute service improvements. As needed agencies would partner with USDS and GSA's Technology Transformation Service to enhance their digital services. One particular area focus would likely be the creation of user-focused digital front doors, rebuilding government web properties to focus less on government structure and more on user experience." Now, those last few words, that last sentence is just music to my ears, although the whole paragraph is just amazingly great. The fact that the US Federal government is putting an actual focus around customer centricity, understanding what the experience is, developing and mapping out those customer journeys regardless of where they are within the organizational silos across the Federal government and then bringing it all together into that customer centric view of things. Through that user focused digital front door experience and look we've heard many, many different ways of saying that in different ways a lot of other agencies and governments will call it a one-stop shop or whatever like that. But having that focus around the customer themselves I think is the way to go and I'm very, very excited by this. So those are the areas that I've been wanting to talk about within the reform plan, but this is actually part two of a three-part series. So next week, I'll be going into a deep dive around this concept I've talked about, that digital front door because there was a section of that quote that I left out. And that was the example site that the US Government reform plan flagged as the direction needed across the US Federal government. It's really, really interesting and it has actionable insights for you and your government regardless of where you are. It's going to take a while to get through so again I want to make sure that I break this up in such a way that you can kind of consume that information at a time that's useful for you. And next week we'll get down into the detail of how this is going to be implemented using the examples of digital front doors across the US Federal government. My name is Gavin Atkinson. This is the Government to Business podcast. Please feel free to subscribe on iTunes or Stitcher or Google Play or wherever you happen to be listening. Make sure you rate and review and I look forward to talking to you very, very soon. 0 Comments on "Podcast episode 10: US Federal Reform and digital capability development"